inglés-what´s the problem: 62.) THE BENEFITS OF "GARLIC" = LOS BENEFICIOS DEL "AJO"
62.) THE BENEFITS OF "GARLIC" = LOS BENEFICIOS DEL "AJO"
"Have you ever thought how many natural things there are to eat that are good for our health and can help us live a healthier and longer life"? = Has pensado alguna vez en cuantas cosas naturales que hay para comer que es bueno para nuestra salud y puede ayudarnos a vivir una vida mas sana y larga? LET´S TAKE FOR EXAMPLE "GARLIC" = TOMAMOS POR EJEMPLO "AJO"
"GARLIC" is the most used medicinal plant in the history of man". "GARLIC" 1.) belongs to the 2.) onion family. It´s known for its antibiotic, antifungal and antiviral properties. It has been used by the Egyptians, Greeks, Romans and Chinsese to help cure a variety of 3.) ailments from bronchitis and 4.) influenza to 5.) whooping cough. Today medical 6.) 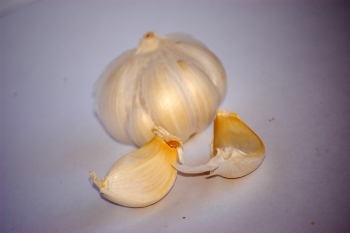 journals contain scientific studies which say that garlic can help fight infections, 7.) as well as 8.) provide potential benefits for diabetes, asthma and cancer suffereres. Perhaps the most exciting discoveries 9.) to date have been that garlic can help against heart disease by 10.) thinning the 11.) blood and helping to lower cholesterol. Garlic contains allicin, a sulphur compound that gives it its 12.) pungent smell. Allicin 13.) encourages the elimination of cholesterol from the body and helps to reduce 14.) fat. In countries where lots of fresh garlic is eaten, such as Spain and Italy, heart disease is less common than in other countries. 15.) Researchers are also looking at the antioxidant effects of garlic, and its anti-ageing benefits, as well as how garlic can help to protect against the bacteria which causes stomach ulcers. So, take one garlic clove a day.The best way to eat garlic is to 16.) mash the garlic clove with a 17.) spoon so it can be digested better together with a glass of water mixed with the juice of one lemon. There are a lot of recipes using garlic, but let´s start with this one. I remember this one because my mother always made this for us and it was delicious especially in the winter. "I made this soup the other day - and here´s what it should look like and it was delicious"
Step 1. Cut about half a 1.) loaf of french bread into 2.) thin twelve 3.) slices. Then in a large 4.) pot add four or five 5.) tablespoons of olive oil and 6.) slightly fry the 7.) five minced garlic 8.) cloves until 9.) golden. Then add six slices of bread and also slightly fry both sides, then 10.) remove the pot from the 11.) stove. 12. )Then sprinkle 13.) one teaspoon and a half of 14.) sweet paprika and mix well. Step 2. In the same pot add one about a liter of hot vegetable 15.) broth and 16.) boil at low 17.) heat for 20 minutes. After the 20 minutes add salt to your 18.) liking and 19. ), a pinch of black pepper and add the 20.) remaining six slices of the bread until it 21.) softens and mix the soup. "Something else which is really good is to toast some french bread, pour a little olive oil on the toast, then add one minced garlic clove all over the bread, and spread minced raw tomatoes"
"Otra cosa que está realmente buenísimo es tostar pan de barra, verter un poco de aceite de oliva sobre la tostada, entonces añadir un diente de ajo troceado por todo el pan, y extender tomate crudo troceado"